I have this distant memory of chilly evenings sitting in front of a blazing fire watching as my dad carefully cracked and shelled bags of walnuts. I loved playing with the nuts before he cracked them, fun little balls to roll around or to toss, but even more fun was turning the crank on the little hand grinder after he pried the nut out of its shell. So many fun walnut memories, but I don't actually remember eating them. It wasn't until I began cooking on my own that I truly discovered how much I loved nuts, and walnuts quickly rose to become one of my favorites. And that was before I understood the incredible health benefits they bring along with their buttery taste. As with all nuts, walnuts are high in fat and must be consumed in moderation, however, just a few nuts a day (recommendations sit at 6-7 nuts a day) can bring health benefits including high levels of Omega-3 fatty acids, reduction of bad cholesterol and an increase in good cholesterol, a good source of protein and generous amounts of anti-oxidants. Their anti-inflammatory properties aid the cardiovascular system, may inhibit the growth of cancer cells, improve memory and benefit the treatment of Type 2 Diabetes. Super Nut?? I'd think yes! The oldest tree food known to man, walnuts have a history dating back to 7,000 BC. Often referred to as "Persian Walnuts", the English Walnut is said to come from Ancient Persia where they were reserved for royalty. Traded along the Silk Route between Asia and the Middle East, caravans carried the precious nuts to far off lands and eventually sea trade brought walnuts around the world. While never actually commercially grown in England, it was the English Merchant Marines who transported the nuts from port to port, thereby gaining the nut the name "The English Walnut". Today, 99% of the US and three quarters of the world walnut supply comes from the fabulous state of California. First cultivated by the Franciscan Fathers in the early 1700's, the first nuts were known as "Mission Walnuts". Trees flourished in the Mediterranean-like climates of California and by the 1870's commercial walnut production had begun near Santa Barbara. Over the next 70 years walnut plantings moved to the central valleys and northern California locations with many of today's trees being descendants of these early plantings. See California Walnuts for more detailed information. 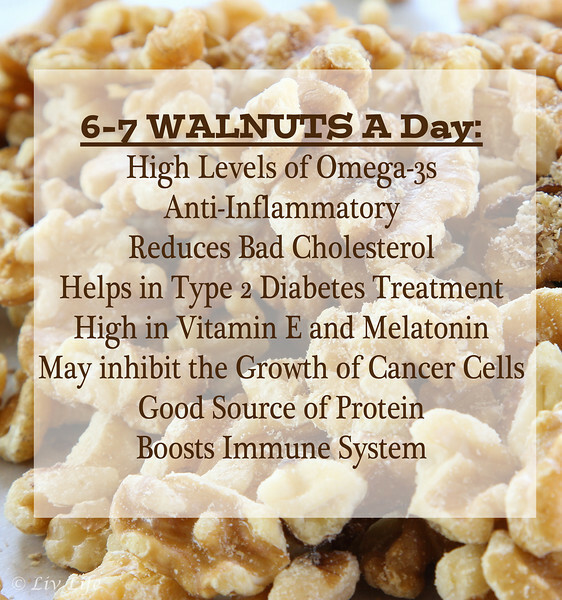 So what do you say... will you join me today, May 17th, in celebrating National Walnut Day?? Receiving a pound of California walnuts from Lester Farms out of Winters, CA, (Thank you Farmwater.org for organising!) 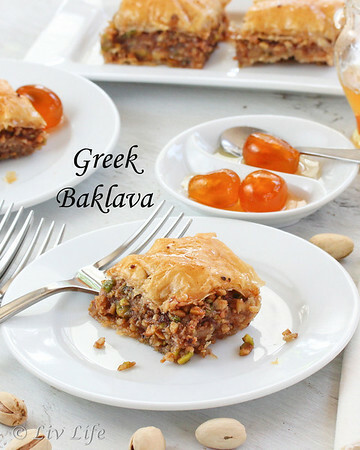 visions of our favorite Baklava flitted through my head, quickly followed by banana nut breads and toffees topped with ground nuts. However Mother Nature took a hand in our recipe decision, and with the local fires here in San Diego (we were within 1 mile of the Poinsettia Fire at one point) my baking plans went up in smoke. Easy enough to remedy though with a simple recipe that I should have thought to share in the first place. 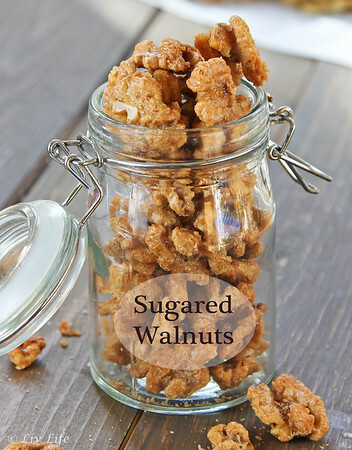 Sugared Walnuts... a must have recipe for anyone who is a walnut fan. Perfect for tossing into a salad or topping a freshly baked sweet potato, but more importantly, ideal for simply eating out of hand. We've made these sweet nuts for years and have even packaged them in jars and wrapped up for gift giving over the holidays. Bring a cute little jar of these beauties as a hostess gift and you'll definitely be invited back! 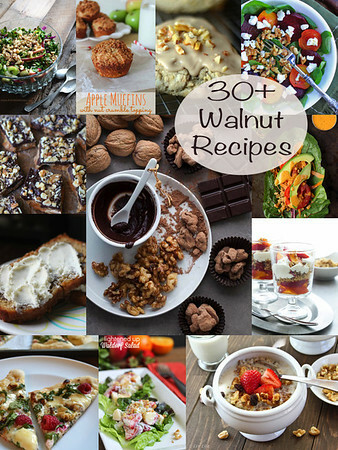 Our Sugared Walnut recipe appears at this bottom of this post, but in honor of National Walnut Day, I couldn't help but bring you more wonderful recipes I've come across in my walnut research. Have a favorite among the bunch? Have one to add? We'd love to see your recipes in the comments below! Toasted to perfection with a sweet crunch... it won't be hard to get in your 6-7 walnuts a day with these guys around! Perfect tossed onto a salad or simply eaten out of hand. Enjoy! Place a small saucepan on the stove over low heat. Add the coconut oil and maple syrup into the pan. Stir until very warm, the syrup does not need to simmer. Pour nuts onto a baking sheet lined with parchment paper into a single layer. Bake for 10-15 minutes, or until the nuts are golden and dry. Stir nuts after about 5 minutes and rotate the pan. Keep a close eye on the nuts at about the 10 minute point... they can go from not done to over done in a flash! 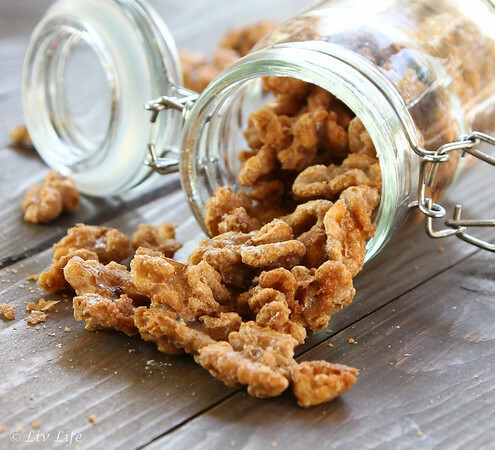 Love this post and the yummy sugared walnuts that go with it! Fun memories of your dad, and loved learning about the origins of walnuts! Our friends make a walnut pomegranate stew at their Persian restaurant and it is delicious! Thanks so much for sharing my Beet Salad in your round-up-can't wait to try some of the other recipes too! Fantastic post with so many great to know facts, from all of us walnut lovers, thank you!! Oh my lord, I need to make these immediately! I love love love candied nuts!